In case you didn’t know, January is National Soup Month, which makes it the perfect time to save some money on your grocery shopping. 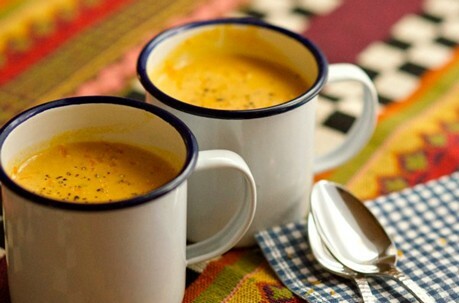 Soup can be a very filling meal during the winter months and will allow you to warm up your body as well. Of course, if you don’t know how to keep your soup menu frugal, you might end up going overboard on grocery shopping. These ten tips will help you make delicious soup at a fraction of the price, so you can get a head start in the New Year. You will also find the meals to be easier than ever to cook, which might inspire you to embrace the soup diet even longer. So, get ready to warm up by embracing National Soup Month. There’s no doubt about it, canned soup is one of the easiest things to make when you’re feeling hungry and want something warm and comforting to eat. The only problem is, canned soups already put a dent in your budget if you plan on eating them all of the time. They are also loaded with salt and other ingredients that might make it a little harder for you to lose weight. Instead of jumping for the nearest cans in the grocery store, you should consider making your soup from scratch. This is actually a lot easier than it sounds and it will allow you a little freedom with your meals. Soups often follow a simple base and the rest of the preparation is simply adding in ingredients. You will find your soups more satisfying, healthier and a lot easier on your budget. Another great rule of thumb when it comes to soup, is to stick to seasonal ingredients. This is going to allow you to choose foods that are fresher and cheaper, which will help your budget out quite a bit. The best thing about eating seasonally is it will also help with your immune system. Shopping in bulk for these items shouldn’t be a problem either. Since you’re already saving money, you can freeze your excess items to be used when they aren’t in season. Seasonal ingredients doesn’t just mean produce either. You should shop seasonally for meats too. This might mean a lot of lean turkey soups during the autumn months, but you’ll learn to love the change in diet as the seasons change. If you have a garden, then you’ve already done yourself a huge favor when it comes to making your soups. You can always plan you soups around the produce that is growing in your garden. During the winter months, try to pull from your frozen ingredients to help clear the freezer for the next blossoming season in your garden. Utilizing your garden will make your soup taste fresher and more delicious. Not to mention, it will be a lot healthier for you. You won’t have to worry about shopping organic or where and how your produce was grown. Best of all, these ingredients won’t cost you a cent, which will help make National Soup Month even more frugal! One of the main problems people run into is not feeling full when they eat soup. If you’re choosing soups just made from vegetables, then this can be one of the problems. You need to add a few filling ingredients to make the dish even more enjoyable. One of the best items to use, especially if you want to stick with a vegetable base, is beans. These amazing ingredients add a lot of dynamic to the meal while helping you to fill up faster. Meats and other proteins, like tofu, are another fine option for the meal. However, you may want to keep to leaner items if you are working on losing pounds this New Year. Finally, dumplings are another amazing way to add to a soup. You can use a wide variety of dumplings, including matzo balls or simply biscuits to help make your soup stick to the ribs. These ingredients shouldn’t hike up the price too much, especially if you’re working with beans or dumplings. A lot of people think they need to go all out to impress when they make their own soups. However, soup can be a very impressive meal to eat even if it is very simplistic. Simple soups not only save you time while cooking, but will also help you to save money as you won’t have to buy too many ingredients. For instance, a nice tomato bisque will keep everyone feeling like they’ve just had a hearty meal even though it only calls for about 3 ingredients, depending on the recipe you choose to follow. Chicken soup is another great option, especially when you’re battling a sickness in the home. If you keep the recipe light, even weak stomachs will be able to handle the meal which could lead to faster healing. So, don’t look for the hardest soup in your recipe book to make, especially if you’re keeping to a budget. When it comes to soup, there are actually many ingredients that work wonders in a wide variety of the soups that you may want to make. So, it is wise to buy in bulk when you plan on cooking soups fairly often. Some of the best items to purchase this way are onion, celery and carrots, which are actually base ingredients for many soups. Soups that don’t require these items as a base often have them as ingredients. Of course, these items can be frozen for use later if you don’t manage to get through the bulk items. Another great option to buy in bulk is broths. These items come in handy if you don’t have time to make your own and can be used for other recipes too if you don’t end up making a lot of soup. Bulk shopping will cut back on the price you pay for items while ensuring you have more than enough ingredients to make multiple meals. Let’s face it, sometimes we just can’t avoid making a soup that has some pricier ingredients in it. If you’re a fan of cream soups, then you know how much this one ingredient can add to the cost of a recipe. Of course, if you’re lactose intolerant or simply want to cut out some of the calories then your cream soup craving might be problematic too. Luckily, there’s lots of alternative ingredients to help you out in a pinch. In this case, you can use cauliflower for the creamy texture with fewer calories. Of course, you may run into a lot of periods in which you think you have all of the ingredients, but end up missing something important. Knowing alternative cooking solutions can come in handy and save you some money and that unwanted trip to the store. If you’re not sure where to start, simply look up the item you need to replace. It might take some experimenting, but you should find a great alternative for future reference. Buying broth can add to the cost of your soup and will give you a few added ingredients that you may not want in your all-natural soup. Luckily, you can always make your own broth from ingredients found in the home. For instance, if you have leftover chicken on the bone then set it to boil and before long you’ll have your own delicious broth. Tougher meats can also be cooked slowly in water and then the broth can be drained later on. Even cut up vegetable scraps can be used to slow cook into a delicious vegetable broth that will help make your vegetarian soup taste fresh and amazing. If you want to make larger batches of broth, then you might consider making your own bouillon cubes instead and freezing them to use later on. No matter what you choose, this will ensure you have tasty soup on a tight budget. If you make a soup and have too many leftovers, then you don’t have to eat soup for days. This can really detour the family from wanting to eat soup, which might make your month of soups a bust. Instead, simply place the soup in bags or plastic containers. You can do this is a large group size or even individual sizes. Place these items in the freezer and you’ll be set for a worry-free lunch or dinner later on down the line. This won’t just save you money and prevent you from wasting food, but it will make your life a lot easier later on when you may not have the time to make dinner or lunch. These prepacked meals are also great to take for a lunch at work or school. Your crockpot can be your best friend when it comes to making delicious soups for the household. For starters, the crockpot will make cooking pretty much stress free. All you do is turn it on and add your ingredients and you’re all set. You can even have the crockpot going while you’re at work, so you can come home to a nice and tasty meal. Another great thing about the crockpot is it will keep your food warm all day when set to do so. So, you make your soup for lunch and people can eat it whenever they get hungry throughout the day. Not to mention, the crockpot will cut back on the energy or gas that you use to cook, which will save you money. National Soup Month is a great way to explore a new variety of soups. This month will allow you to enjoy warm and hearty meals that are good for you and will help cut back on the calories you want to avoid. With these handy tips, you’ll also be able to save money while enjoying the delicious food you try. You may love soup month so much that some of the recipes may even become a staple all year long.